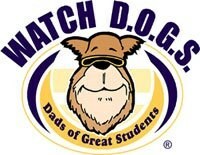 We are renewing our commitment to the WATCH D.O.G. program again this year. WATCH D.O.G.S. are fathers and father figures who volunteer one day at our school during the year. WATCH D.O.G. volunteers perform a variety of tasks during the day including assisting with arrival and dismissal, monitoring the cafeteria and playground, and working with students in the classrooms. Please remember to complete the TISD Volunteer Application prior to sign up. The volunteer application must be completed annually and should be completed at least two weeks prior to scheduled Watch D.O.G. day to allow adequate time for approval.